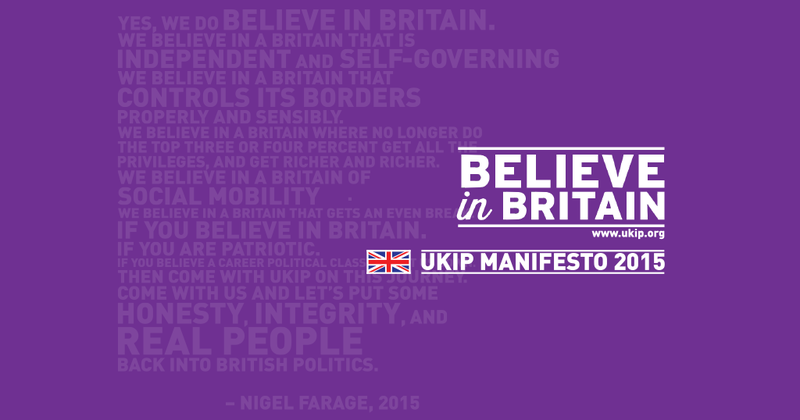 UKIP is different, at least that's what the manifesto professes. Although their manifesto is the only one to be presented landscape, their set of pledges are not significantly different from those of three established parties. They include: increasing the personal allowance (Labour, Tories & Lib Dems), improving the NHS’s mental health provision (Labour, Tories & Lib Dems), reducing the size of parliament and equalising constituency size (Tories), and even stopping the exploitation of those on zero-hours contracts (Labour). But let’s be fair here – at least fairer than their proposed referendum question – there are some sensible things in their manifesto too, particularly with the political reforms they propose. These include a right for the electorate to recall their MPs for misconduct, which makes sense in a world where politicians are not trusted, and introducing open primaries for MPs, meaning that even in safe seats the electorate will get a say on who represents them. They also propose a proportional electoral system – although no specific system is suggested – and the much needed equalisation in constituency size. They also pledge to end the Barnett formula (the system of allocating money to Scotland), not something that is likely to endear the party in a Scot's eyes, and a pledge to give Scotland full tax raising powers instead. Due to the party’s lack of support in Scotland - although they do have more MEPs than the Lib Dems (sorry Nick!) - this policy is mainly there to play on the English’s fears of unfairness and, also, to bolster the party in Wales - where they may out poll Plaid Cymru. Remember the three established parties have promised to keep the Barnett formula! Interestingly, UKIP also propose something called “The Citizens' Initiative” which will allow the public to call national referenda on “issues of greatest importance to the British Public.” This is similar to the system in Switzerland, where the ruling UKIP-esque Swiss People's Party have supported initiatives to ban the construction of new minarets on mosques, ending “mass immigration” and deporting foreign criminals – UKIP can't have similar hopes for our system...can they?! You couldn't have a UKIP manifesto without the now famous UKIP policies: increasing defence spending to match our NATO commitments and making sure those bloody foreigners get less aid by cutting it from 0.7% of GDP to 0.2% to match the USA (although I do have question the aspiration to be like the Americans…). As well as, supporting our war veterans and guaranteeing them jobs in border agency, and supporting the good old Great British pub. This strategy should gain them 2 or 3 seats and plenty of second places as a base for the next election. The key to their campaign is South Thanet, Nigel Farage's prospective seat. If they fail to win here Farage has promised to step down and then we may have a very different looking UKIP. Remember this South Thanet voters!